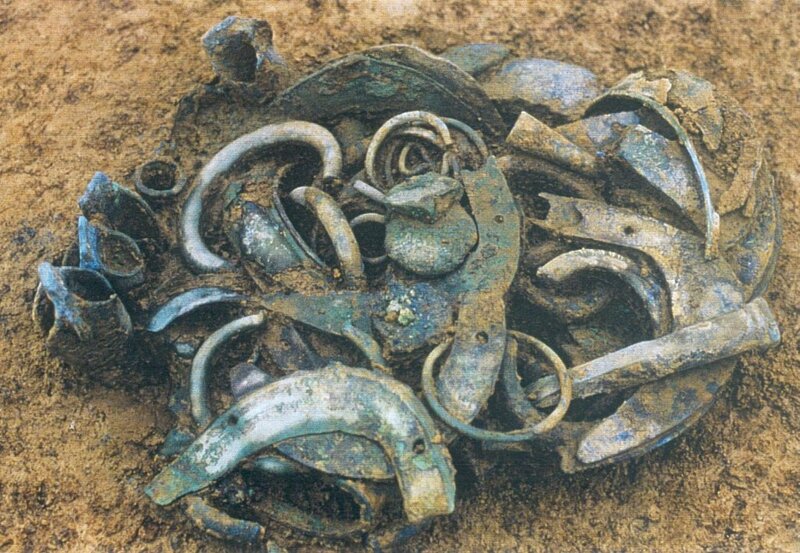 The hoard of Farébersviller (Moselle, France) was discovered in 1991 during rescue excavations (See Image above). This set contains 130 "bronze" artifacts, which date to the Late Bronze Age (8th century BC). The technological study of the forming process consisted of three complementary approaches: detailed observations with a binocular microscope, secondly, revealing the alloy composition. Lastly a metallographic examination of samples was made to characterise the microstructure of the metal. Metallographic examination indicates clearly the forming processes that were used for making bronze artifacts (...) Craftsmen had a good knowledge of bronzes. Four objects of the hoard were examined using these three steps. The first object, a bracelet with buffers, appeared to have a typical as-cast structure. It was probably manufactured by using the lost wax casting technique. Secondly, the decorated torc was examined. It was made using a strip of 4 cm wide and 1.5 mm thick, which was mainly formed by hammering. The Vaudrevange type bracelets are also made of a large and very thin strip; but the metallographic examination of these two items show that casting was the main forming process in this case. This study outlines the advantages of technical and metallographic examinations. Without this, it is impossible to know the exact forming process. Also, we can understand the technology which was necessary for casting artifacts with very thin parts, this in combination with the use of ternary alloys (Cu-Sn-Pb). For the last ten years, all urban projects in Lorraine have to be examined by the "Ministère de la Culture". In 1991, an industrial area project of 90 ha, located at Freyming-Merlebach (Moselle) (See Figure 1) was proposed. Sampling or spot checks had to be made; the method applied consisted of excavating 6% of the surface of the project area mechanically. The hoard of Farébersviller was discovered during this operation (See Figure 2). Nothing was found in a circle of 50 metres around the hoard to place it in a context. The find was taken up as a whole and then gently excavated in the laboratory (Antoine et al. 1991; Mervelet 1992). The typo-chronological investigations resulted in a dating to the last part of the Late Bronze Age (8th century BC). Most comparable artifacts come from hoards of Lorraine or neighbouring areas, like Sarre in Germany (Faye 1995 and 1997; Veber 1998 and forthcoming). Formulation of the problem and methodology followed. The first step for understanding the forming processes consisted of making detailed observations with a binocularmicroscope. As a result it should be possible to identify marks of different steps in the life of the artifact. marks of hammers and/or anvils. defects in making the decoration. repairing with patches or rivets. After this examination under magnification, the combination of metal analysis and metallographic examinations is the next important key for the reconstruction of ancient technologies. • leaded bronzes, i.e. ternary alloys made with copper, tin and lead. Both tin and lead as alloying elements of copper based alloys result in typical effects. 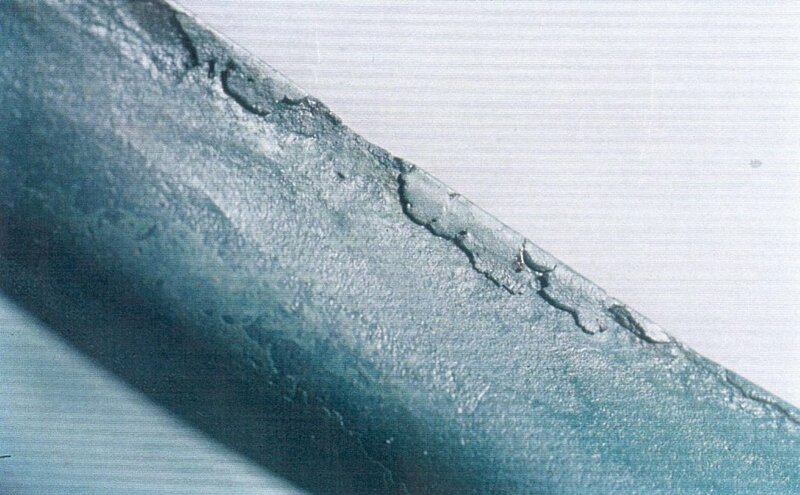 The more heterogeneous an alloy, the greater is the risk to get cracks and fracture during hammering. The probability of obtaining a two-phase alloy increases with the tin content. In the as-cast state, a 6% tin bronze can contain particles of tin-rich phase (α+δeutectoid), which is hard and brittle. The way of forming 10% tin bronzes is by making gentle passes of hammering and annealing, followed by water quenching, until the alloy is homogenised. Lead melts at 327ºC. Adding lead makes the alloy more fluid and the casting easier. Lead forms inclusions in the cast bronze, which do not dissolve into the alloy during hammering. Therefore, lead was normally only added for cast objects. Metallographic examination consisted of using Optical and Scanning Electron Microscopy (SEM), on very well polished sections of sound metal. The size of the samples was about a few mm3. For thin parts, an accurate measurement of the thickness is one of the goals. The examined metal was composed of grains and inclusions (sulphides, pores, lead globules and particles of the tin-rich second phase); all those elements are three-dimensional and form the microstructure. The samples must be chosen according to the formulation of the problem. It was often necessary to take several samples: one lengthwise and another over the width as to build a picture of the microstructure and to understand it from the different features. Each sample had to be carefully polished and etched with an acid solution to reveal the grain boundaries. 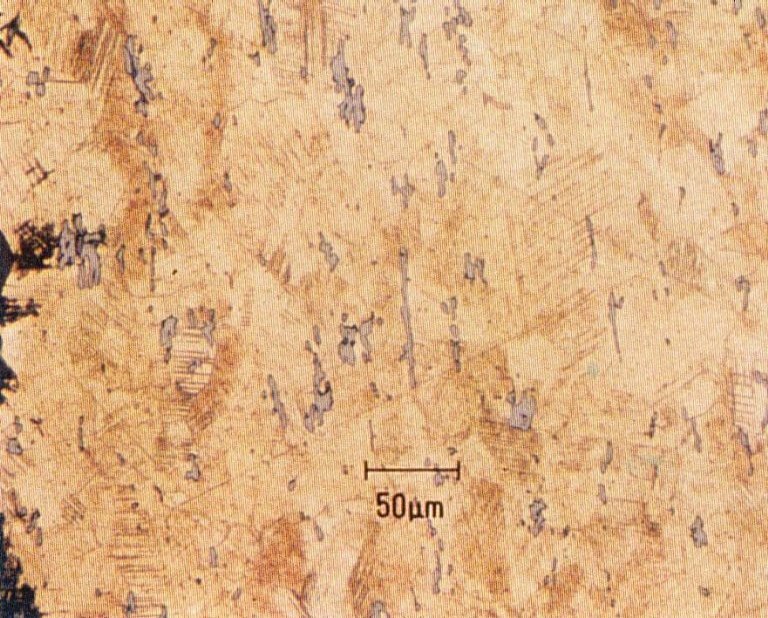 The features of the microstructure (mainly shape and size of grains, types, shapes and size of inclusions) are the witnesses of the thermo-mechanical history of the alloy in this part of the artifact. Next to other information, such an observation gives a clear answer to questions about the use of hammering after casting (to get more details about metallographic examinations see Pernot 1998 and 1999). Four artifacts have been studied, namely a bracelet with buffers, a decorated torc and two Vaudrevange type bracelets. There was only one fragment of this type of bracelet in the hoard; a widthwise sample was taken at the broken end. Observations by the naked eye and using the binocular microscope suggested that this bracelet was cast, as different marks could be identified. This assumption was confirmed by metallographic examination revealing the alloy to be in an as-cast state (See Figure 4b). The alloy contains 9.5% of tin and 5.5% of lead. A typical as-cast structure can be seen in figure 4b. Its structure is inhomogeneous and the dendritic grains are visible. The two phases can be identified as well: the particles of tin-rich phase appear in light grey, among the matrix of the alpha phase. The dendrites are not bent and there is no sign of a beginning recrystallization. Therefore the bracelet is a rough casting, niether hammering, other cold working nor annealing has been done. Only a finishing treatment of the surface has been made to hide the marks of moulding and to get a shiny surface. It is noticeable that the inside surface was rough, which could be a result of casting on a porous material like fired clay. Therefore, in this case, probably lost wax casting was used as forming process, with a clay core to obtain the hollowness. 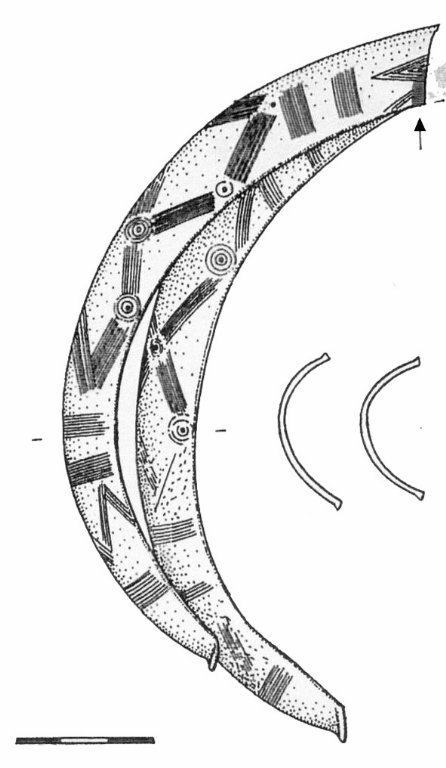 The two broken parts of the torc had been deposed one into the other (See Figure 5a). The decoration on their external surface is composed of transversal double stripes, chevrons and lozenges. Every element has been drawn with thin lines and small circles; in the middle of these circles, there is a more deeply marked point. Important wear traces on the decoration can be identified on the maximum diameter, i.e. in the middle of the piece. Almost everywhere, only the central point of the decoration remained. 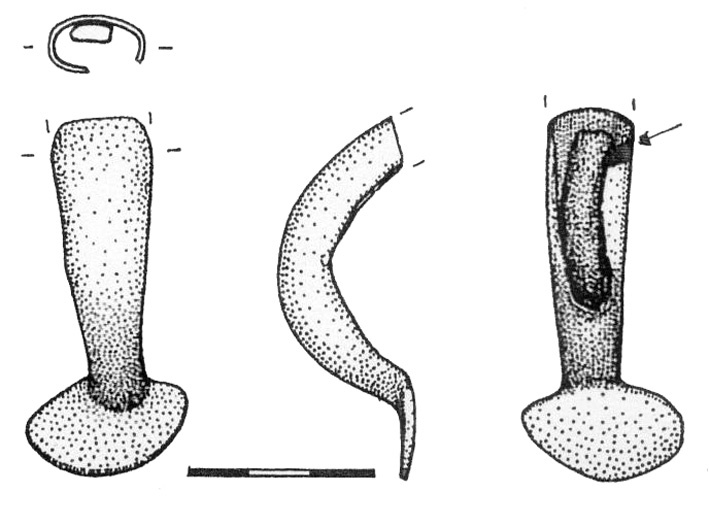 Furthermore, countless micro-cracks exist on the whole external surface (See Figure 5b); they are perpendicular to the length of the artifact and between 1 to 10 mm long. A sample was taken at a broken end. The polish section of the sample is widthwise and it includes a part of the decoration. 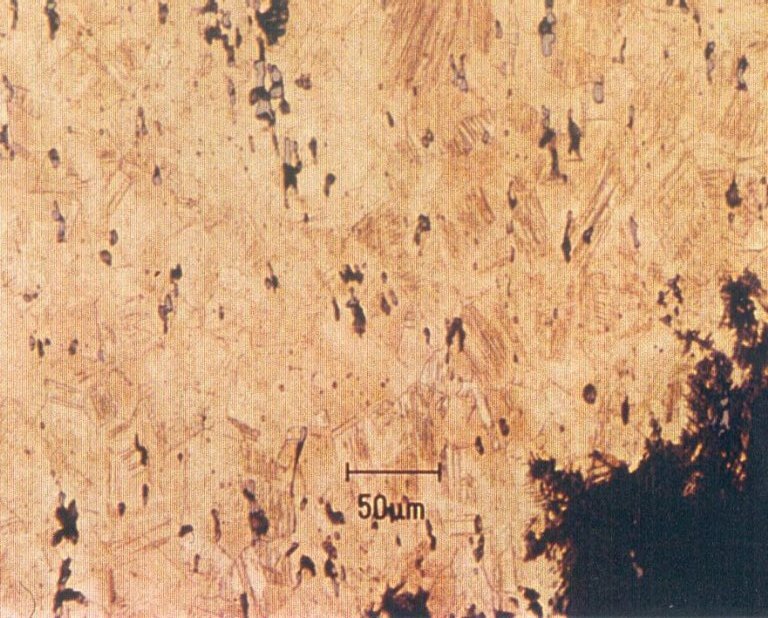 Metallographic examination (See Figure 5c and 5d) revealed a single-phase alloy; chemical etching shows a complete recrystallised state; the grain size is about 20 to 50 µm; there are no remains of dendrites. The alloy contains 10% of tin and 0.7% of lead. Mechanical twins (set of parallel thin lines in the grains) appear as a result of plastic deformation, by hammering for example. Recrystallization is the formation of new grains in the deformed matrix during annealing (heat treatment), for a 10% tin bronze typically 10 minutes at 700ºC. Large bands in the grains are annealing twins; for copper-base alloys, they are also a characteristic of annealed structures. Normally, at the end of annealing the alloy is water quenched to avoid precipitation of the hard and brittle delta phase. Then the metal is ready for another pass of hammering with little risk of failure. 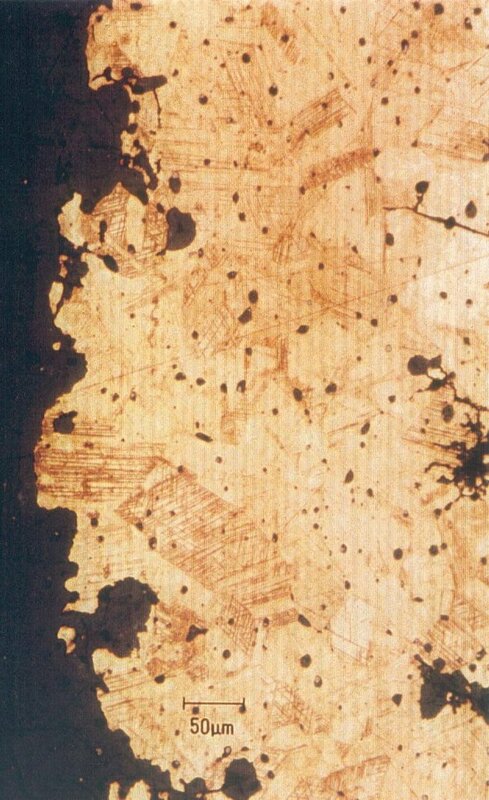 During the three or four first working stages (hammering, annealing and quenching) the dendrites are broken, new grains appear, the particles of tin-rich phase dissolve, making the alloy become as homogeneous as possible. Sulphide and, if there are some, lead inclusions remain. Lead inclusions globulize during each annealing. 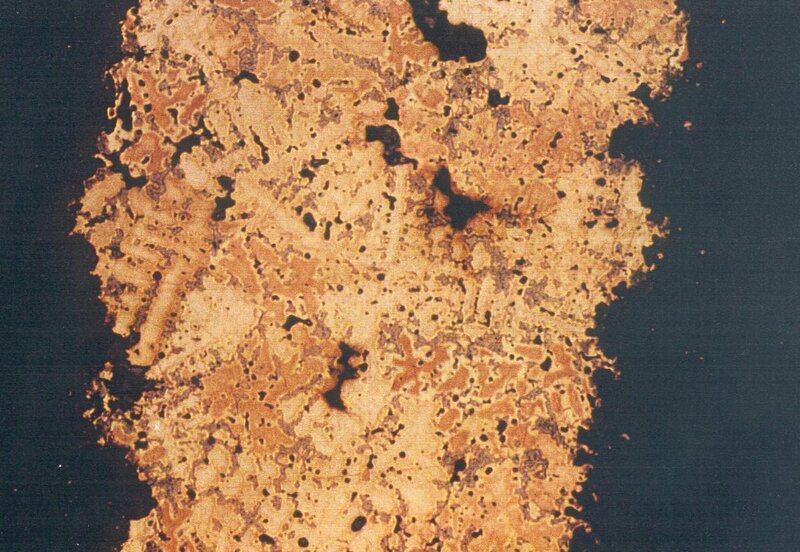 Sulphide inclusions are plastically deformed during hammering but they do not change shape during annealing. Their actual shape is a witness of the total deformation (with all stages cumulated) undergone by the alloy. In the as-cast state, the sulphide inclusions present often an "amoeba" shape ; this shape becomes more and more elongated with increased deformation. A second deformation step after the forming process can be identified in one end of the sample (See Figure 5d). In this area mechanical and annealing twins are slightly bent and all the sulphide inclusions are broken. 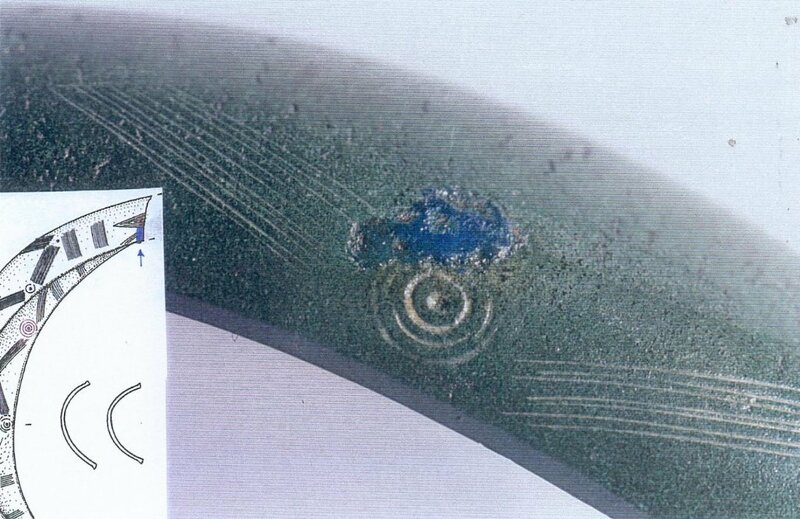 Those microstructural features are traces of the deformation, which was caused by the hammering and folding, necessary to break the torc before deposition. The Vaudrevange type bracelets could as well have been ankle-rings. Two out of the eight of this type have been studied. The artifacts consist of a large stripe with a double convexity. The stripe is 0.3 to 0.8 mm thick, depending of the piece; the edges of the stripe, with a triangular shape, are thicker, from 2.5 to 4 mm depending of the piece. The thickness at the ends of the bracelet is between 1 and 2 mm. Important lengthwise cracks can be seen on both studied objects. It is significant to notice, these bracelets were twisted to break them. One (object 19.3) of the alloys has 11.5% tin and 9.6% lead; the other (object 19.5) has 8.4% tin and 2% lead. Widthwise samples were cut for metallography. Several colours could be identified during microscopic examination. This revealed the alloy to be in a multi-phase state. 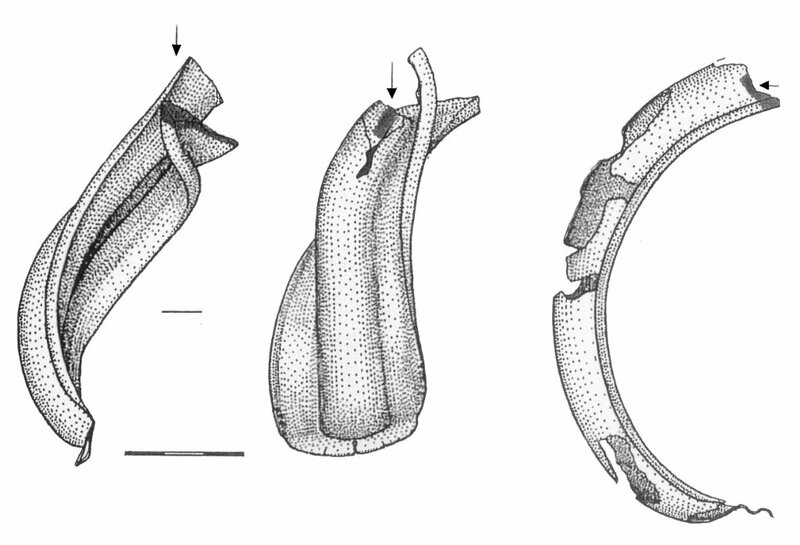 Bracelet 19.3 - Many inclusions can be identified (See Figure 6b). There are small pores and sulphide inclusions, all with a globular shape. Lead particles are globular and more numerous in the triangular edge than in the centre. The grains still have a dendritic shape, tin-rich second phase nodules are visible and the sulphide inclusions are not elongated. This bracelet has probably undergone a very slight hammering only. Bracelet 19.5 - The microstructure of the sample which was taken of the central part is more recrystallized than in the triangular edge (See Figure 6c); it is also more homogeneous as many annealing twins can be identified. 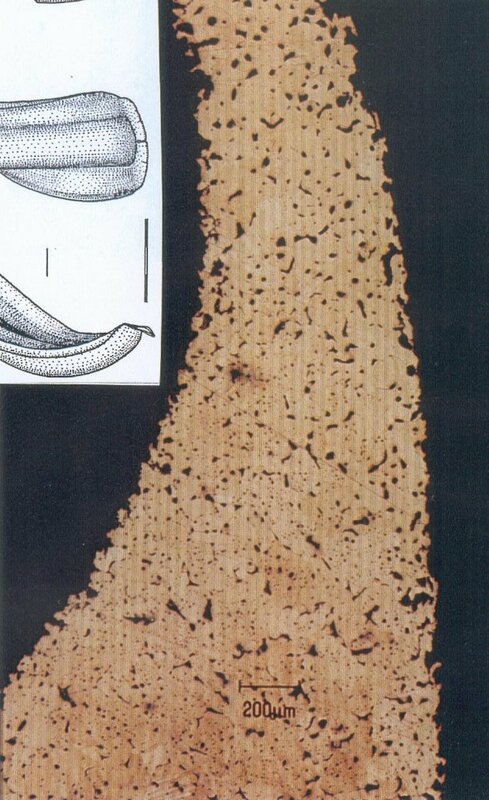 In the triangular edge, dendritic grains and nodules of tin-rich second phase are visible. That means that the central part was slightly worked by hammering and that the whole piece was annealed. All the Vaudrevange type bracelets found in the hoard of Farébersviller and in other hoards in Lorraine, have long cracks in their middle part (Reboul, Millotte 1975). The outline of those cracks does not agree with a "true sheet" which would have been obtained by plastic deformation. Therefore it is assumed that the main forming process for those objects was casting. They were cast with a thickness very close to what the final objects would consist of. The lengthwise convexity was probably obtained by casting. After annealing, with a slight hammering the object would reach its final shape. The same conclusion as to the production process is supported by some casting defects observed inside the objects (See Figure 7). The aim of the hammering was to finish and to smooth up the shape of the bracelets but also to harden the alloy, in the same way as it is usually done for bronze dishes. Therefore, these bracelets were not made from a "bronze sheet" because the thin parts were not shaped by hammering, but by casting. If a bronze artifact, with very thin parts, has not been examined by metallography, it is difficult or close to impossible to identify the main forming process used. It should be described only by geometric features (Veber, Pernot 2000). Metallographic examination indicates clearly the forming processes that were used for making bronze artifacts. The existence of thin parts, (less that 1 mm thick) is not an argument to state that this part was hammered. Mainly from the shape of the sulphide inclusions, metallography is the only way to be sure whether the main process was casting or hammering. Craftsmen had a good knowledge of bronzes, that is copper-tin binary alloys with a tin content around 10%, and of leaded bronzes, that is copper-tin-lead ternary alloys. The former alloys were chosen when an important plastic deformation by hammering and annealing was to be performed. The latter alloys were used when the forming process was casting; the scatter of the lead content (2 to 9%) shows that they have not a very good control of the lead amount added. On the other hand, craftsmen, of this period (8th century BC) and of this area (Lorraine, Sarre et cetera), were able to cast artifacts with very thin parts, probably using lost wax casting process. MILLE, B., and D. BOURGARIT, "La spectrométrie d'émission atomique, un outil pour la détermination de la composition chemique élémentaire des alliages à base de cuivre", À la recherche du métal perdu - Les nouvelles technologies dans la restauration des métaux archéologiques, Musée archéologique du Val d'Oise, Paris, Éditions Errance, pp. 75-78, 1999. PERNOT, M., "Mise en forme des alliages métalliques dans les cultures anciennes du monde occidental; La métallographie", À la recherche du métal perdu - Les nouvelles technologies dans la restauration des métaux archéologiques, Musée archéologique du Val d'Oise, Paris, Éditions Errance, pp. 31-38; 65-67, 1999. 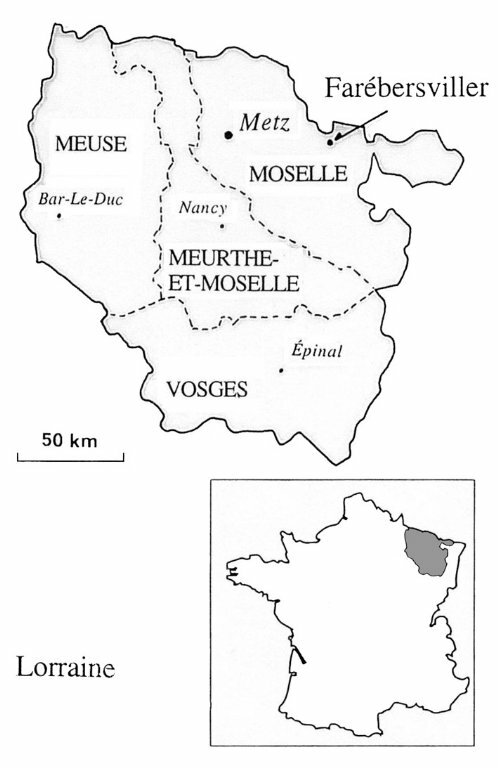 VEBER, C., "Le dépôt de Farébersviller (Moselle)", Archeologia Mosellana, vol. 4, pp. 37-80, 2002.